I always know I'm in for a good time whenever I read an Eileen Cook novel. They're addictive and entertaining—just the kind of book I love to read in one sitting. 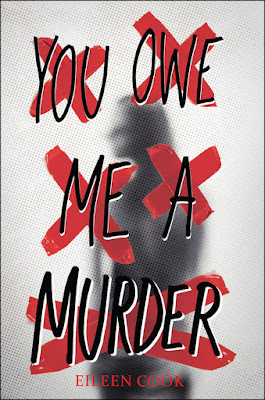 And when I first read the awesome plot description for You Owe Me a Murder, I just knew I had to read it right away too. Secrets. Lies. Blackmail. Murder. I was definitely immediately hooked! When Kim is stuck on a summer program to London with her ex-boyfriend and his new girlfriend, she's not exactly in her happy place. She thought she'd be holding hands with Connor as they took in all the historical sights, but now she has to watch him with his hands all over another girl instead. While waiting for their flight to depart from Vancouver, things start looking up for Kim when she meets Nicki, a fellow traveler on her flight. I probably made some interesting expressions while I was reading You Owe Me a Murder. I definitely cringed and shook my head in dismay when Kim told unnecessary lies. Well, not really lies. She was just really good at withholding certain details and telling the bare minimum. But with an ongoing police investigation, I kept wondering if/when the police would look more closely into her statements and it stressed me out a little every time they interacted. As for Nicki, well, she is one scary, unpredictable girl! Nicki seemed to know exactly what buttons to push to pressure Kim and make her feel cornered. She came and went like a ghost, appearing before Kim to remind her that time was running out before she had to return home to Canada. Ominous music started playing in my head whenever Nicki was around because you knew things would take a turn or Kim would have to adjust her plans to counter her all over again. With several thrillers under her belt now, Eileen Cook is getting really good at layering the tension, distorting the truth, and throwing out misdirections to keep you on the edge of your seat. While I did guess a couple of the twists correctly this time around, I had no idea how the ending would ultimately play out, so I still eagerly turned the pages to discover what would happen next. 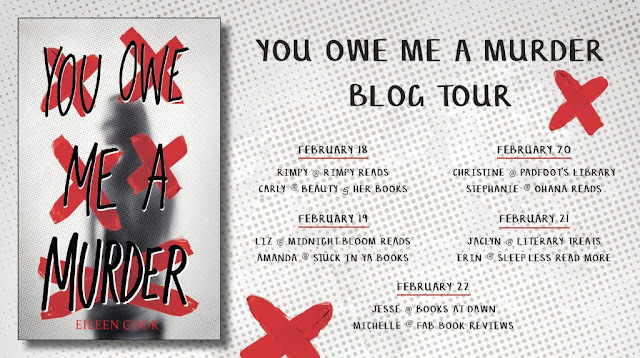 If you're looking for your next compelling and devious YA thriller to read, I highly recommend checking out You Owe Me a Murder. In With Malice, Jill is experiencing amnesia and can't recall the car accident that killed her best friend. In The Hanging Girl/One Lie Too Many, Skye gives fake psychic readings and gets swept into a police investigation for a missing girl. Now, in You Owe Me a Murder, Kim is blackmailed into committing murder or she'll take the fall for one. If you had to switch places with one of your heroines in these thrillers, who would you choose and why? Oooh, hard question! I’m pretty miserable to all my characters and put them in horrible situations. I’d rather have my boring life any day of the week. I like a no-drama existence when possible except on the pages of books. If I have to choose one, I would trade places with Kim. My reason being that despite the horrible situation she’s in, she does have some good people on her side—a bit more than my other two characters. Her parents drive her crazy, but they love her. She has a best friend (granted, miles away) and she becomes friends with Alex, so she’s got some support as she struggles through this situation. I’ve come to believe having been through some hard situations (full transparency- never murder!) that the most important thing you can have is friends. People who will be there to help pick you up during the times that that you don’t believe you can do it yourself. Each generation, a competition is held to find the next empress of Honoku. The rules are simple. Survive the palace's enchanted seasonal rooms. Conquer Winter, Spring, Summer, and Fall. Marry the prince. All are eligible to compete-all except yokai, supernatural monsters and spirits whom the human emperor is determined to enslave and destroy. Mari has spent a lifetime training to become empress. Winning should be easy. And it would be, if she weren't hiding a dangerous secret. Mari is a yokai with the ability to transform into a terrifying monster. If discovered, her life will be forfeit. As she struggles to keep her true identity hidden, Mari's fate collides with that of Taro, the prince who has no desire to inherit the imperial throne, and Akira, a half-human, half-yokai outcast. Each generation, a deadly competition is held to choose the next Empress of Honoku. All are eligible to compete—except yōkai, supernatural monsters and spirits whom the human emperor is determined to enslave or destroy. 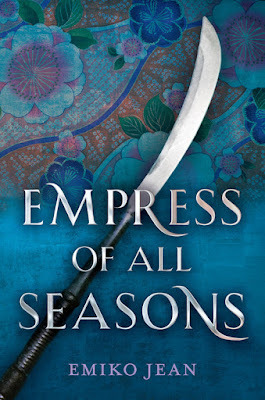 Renee Ahdieh's Flame in the Mist meets Kiera Cass' The Selection, Emiko Jean's Empress of All Seasons is a thrilling and utterly captivating standalone Japanese-inspired fantasy. 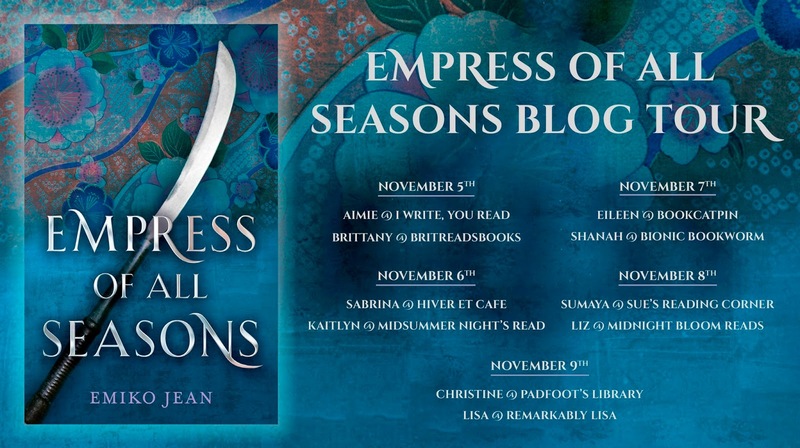 You'll definitely want to set aside some time to read Empress of All Seasons in one sitting because you won't be able to put the book down! It's just SO good and suspenseful. I loved reading it! Mari has never felt comfortable in her skin nor among her clan of Animal Wives, female yōkai who marry rich husbands and then steal their fortunes before returning to Tsuma, their remote village in the mountains. When it became apparent that Mari didn't inherit her mother's beautiful features, all the better to lure potential husbands, she was forced to train for the competition instead. Conquer the seasons. Marry the prince. Steal his fortune. 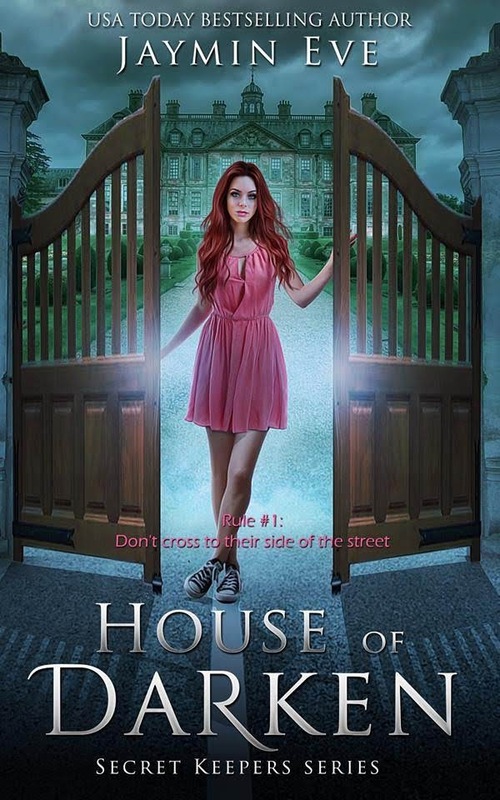 Surviving in the Palace of Illusions is the only way Mari can ever return home. Akira has always been an outcast; half-human, half-yōkai, he's known as the Son of Nightmares. His friendship and love for Mari has been a lifeline since they were children, but he wishes he could be as strong and brave as her. He follows Mari to the Imperial City, seeking out the mysterious Weapons Master to train him and finds himself joining the yōkai resistance. And then there's Taro, the prince who dreams of leaving the palace and doesn't want to be anyone's prize. I loved that the book alternated POVS between Mari, Akira, and Taro. It gave us the opportunity to understand their thoughts and actions, to empathize with their self-doubts and insecurities, and hope they could all make it out of the precarious situation alive. They were each struggling in their own way, torn between their responsibilities, duty, vengeance and love. And I really loved the world-building in Empress of All Seasons! All the little details, from the descriptions of the various kinds of yōkai to the samurai and the kimonos that Mari wears—it all brought the story absolutely to life. Lately, I've been feeling kind of burned out with the YA fantasy genre because half the books seem to have similar plots or covers. It's #ownvoices books like Empress of All Seasons that I appreciate for giving me something entirely new and exciting to read from a fresh perspective. Dear publishers, more Asian-inspired fantasy books by POC authors, please! When a twist of fate causes 15-year-old Hallie and 82-year-old Susan to switch bodies, how will they return to their own bodies? When I first read the plot description for Sylvia McNicoll's Body Swap, I was immediately intrigued! For many of you, the plot might bring to mind something along the lines of Freaky Friday, but my first thought was actually a Chinese movie called 20 Once Again. It's about a grandmother who becomes a teen again and experiences love and family from a new perspective. The movie was funny and sweet, and I'd hoped Body Swap could evoke those same feelings. And it sure did! 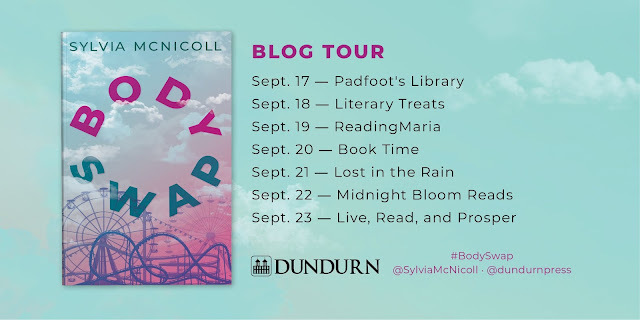 Hilarious and heartwarming, Sylvia McNicoll's Body Swap is an unforgettable story of life and death, a very unlikely friendship, and an engaging look at how technology can both help and harm us. Hallie's reaction when she finds herself an old lady were laugh-out-loud funny. Wrinkly skin! Bulging blue veins! Aching joints! And then there's Susan, who's absolutely enjoying feeling young and athletic again, who doesn't need to worry about arthritis or taking her daily pills. To get their bodies back, Hallie and Susan must team up to prove there's a brake defect in Hurricane SUVs, the vehicle which struck Hallie and killed her, and caused Susan to have a heart attack... and basically got them all into this mess. But before they can begin their investigation, Hallie and Susan must convince their families that everything is normal. They immediately buy the latest smartphone to help them text/call/video chat each other (thanks Susan's Visa card!) and invent a reason for the pair to be together in front of their friends and family. I really enjoyed seeing Hallie mature over the course of the book. This little adventure is sort of blessing for Susan because she's already experienced life and raised her children; feeling young again for a few days is a joy. But for Hallie, it feels like the end of the world. She's never even kissed a boy! She's much more indignant about being in an old body, and it gives her a deeper sense of appreciation for her own body, one she felt was always a little too short and thighs too big. And by pretending to be Susan, Hallie realizes it's actually hard to be elderly. Your body is slowly failing you, people don't trust your memory or judgement, and you can feel lonely. Susan's son also keeps encouraging her to live in a nursing home. I absolutely enjoyed reading Syvia McNicoll's Body Swap! It had compassion. It had heart. It brought the laughs. I just had all the feels by the time I finished reading it. I really wanted Hallie and Susan to get their bodies back, to find a happy peace with their lives. And with the novel set in Burlington, Ontario, I loved catching all the Canadian references like Alice Munro, the Blue Jays baseball team, and the QEW. A story set in a Canadian city and written by a Canadian author. Yes! So. Awesome. 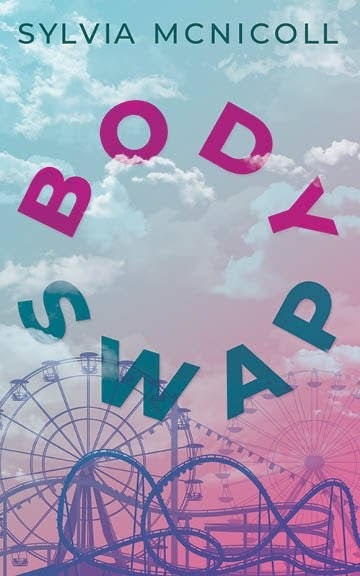 Please enjoy listening to Canadian author Sylvia McNicoll read a thrilling excerpt from Body Swap, in which driving a Hurricane SUV gives Hallie and Susan quite a scare! In this heart-pounding conclusion to the Witch’s Child trilogy, Catherine Egan’s masterful world-building and fiercely flawed heroine will thrill fans of The Rose Society, Graceling and Six of Crows. Julia has been ensnared in so many different webs it’s hard to see how she’ll ever break free. She must do Casimir’s bidding in order to save the life of her brother. She must work against Casimir to save the lives of most everyone else she knows. Casimir demands that Julia use her vanishing skills to act as a spy at court and ensure that a maleable prince is installed on the throne of Frayne. But Julia is secretly acting as a double agent, passing information to the revolutionaries and witches who want a rebel princess to rule. Beyond these deadly entanglements, Julia is also desperately seeking the truth about herself—how is it she can vanish? Is she some form of monster? Is her life her own anyway? With every move she makes, Julia finds herself tangled ever tighter. Should she try to save her country? Her brother? A beloved child? Can she even save herself? 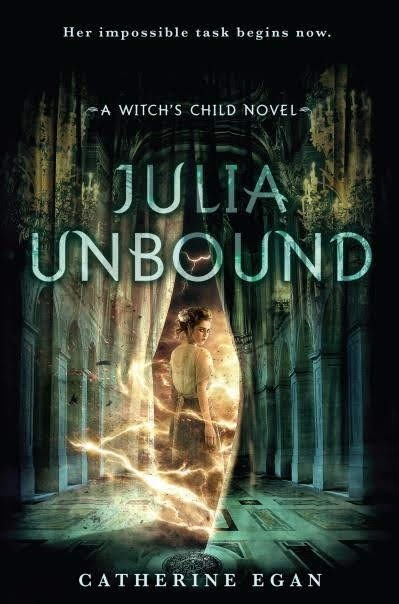 The Witch's Child trilogy comes to an exhilarating finish with Julia Unbound. Casimir is still searching for Theo, determined to claim the last third of the Book of Disruption. Julia has temporarily hidden Theo at Ragg Rock, just beyond the Xianren's reach, but it won't stop him for long. Threatening her brother Dek's life, Casimir has implanted a nuyi into Julia's arm, and now she has just over a week until she loses her free will and he can control her. As if that wasn't enough, Zara and the not-actually-executed Lady Laroche are planning a rebellion in Frayne against the dying King Zey and Agoston Horthy, his powerful prime minister. It's because of Horthy's terrible influence that witches have been hunted and drowned for decades. Everyone seems to have their own agenda... and everyone wants a piece of Julia. Using her exceptional ability to vanish, Julia must act the part of double agent, keeping an eye on Horthy and passing information to both Casimir and the witches. Julia Unbound was stressful to read! But like in a good way? As you can see, there was A LOT happening in this book. Spying. Rebellion. A race against time. The threat of discovery. Allies you weren't entirely sure you could trust. I don't know how Julia kept it all together without falling apart, but she did her best. She stayed focused, kept her convictions, and when there wasn't much choice, she tried to pick the lesser of two evils. I really admired Julia's strength and tenacity in Julia Unbound, and it reminded me just how much she's changed and grown since the first book. I think the best surprise about this series has been the unlikely friendship that's developed between Julia and Pia. When we first met Pia in Julia Vanishes, she was the scary henchwoman of Casimir. In Julia Defiant, Pia unexpectedly saved Julia from harm, and we learned about her tragic, heart-breaking past. She still worked for Casimir, yes, but she didn't seem like such a villain anymore. In Julia Unbound, we saw another side of Pia yet again; she was defiant and willing to side with her friend. I feel like the witches of Frayne still didn't quite get the vengeance they absolutely deserved, but I was more than satisfied with how Julia Unbound concluded. As long as Julia and her loved ones could make it through calamity safe and together, then I was happy was for her. I've absolutely enjoyed reading the Witch's Child trilogy, with all its wonder and suspense, detailed world-building, and intriguing cast of characters. I can't wait to read whatever Catherine Egan writes next! Jaymin Eve's House of Darken is pure entertainment. It's one of those books where I just enjoy it and try not to question certain plot/characters because I know I'll just start picking things apart. Does it make sense that Emma moves into a gated community where one side of the street is filled with beautiful mansions while the other is rundown, small houses? No, it really doesn't at all... but whatever, just roll with it. The plot spans over the course of maybe a week or so, and while the action and fantastical elements were fun to explore, I thought the character relationships were undeveloped. Emma simply didn't have enough time to get to know the new people in her life. I think I would've liked Emma more if her character didn't feel so inconsistent at times, mostly when it was an obvious ploy to bring her and Lexen together. Emma and Lexen's relationship didn't have any naturalness; it was just expected that they'd be together. I like having some tension and chemistry in a developing romance, and this one felt forced. Lexen was supposed to be the resident bad boy... and I didn't see that at all. He was a protective brother and friend—there's nothing bad about that. I did enjoy unraveling the mystery/strangeness behind Astoria and learning the secret Lexen and his family were hiding. It's too bad the villain wasn't a surprise though. 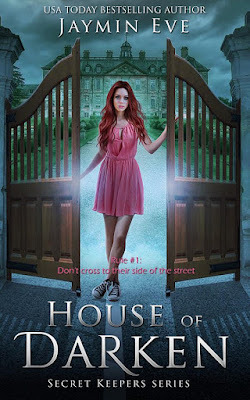 I liked House of Darken, but I didn't fall in love with it. I mainly read it because I was in the mood for something paranormal, and at the time, I'd been impatiently waiting for the release for Strength to be released so I could have more Willa Knight and the hot Abcurse brothers. I still much prefer the Curse of the Gods series, which Jaymin Eve co-writes with Jane Washington. 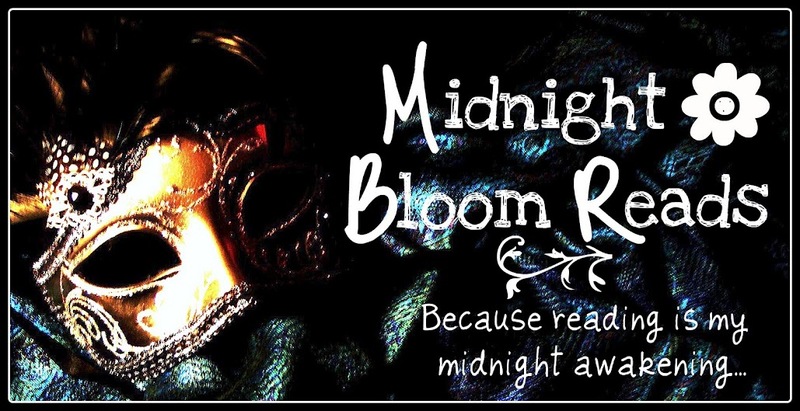 Welcome to Midnight Bloom Reads! I'm Liz, a Canadian girl with a passion for reading. When I'm not escaping reality with a new book, I love to listen to Korean pop music or watch Korean/Chinese dramas.